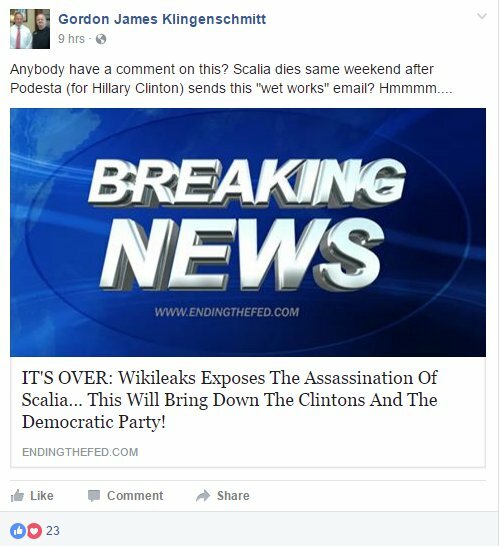 At the end of last year, in an investigation of the Facebook pages of Colorado state legislators, I revealed that then State Rep. Gordon Klingenschmitt (R-Colorado Springs) posted a fake-news item in October claiming that Wikileaks documents proved the “assassination of Scalia” was orchestrated by the Clintons. I asked “Dr. Chaps,” as Klingenschmitt calls himself, why he hasn’t removed the fake news. I wrote back to Klingenschmitt and told him that the Podesta email actually referred to a smear campaign against Bernie Sanders, and had nothing to do with an attack on Scalia, according to Snopes. Still, I wrote to Chaps, I hoped he and I could agree that facts matter, and so I was wondering if he would sign my Fake News Pledge for citizens. See it and sign here. The pledge, essentially identical to the one for elected officials, relies on mainstream-media fact checkers, like Snopes, as arbiters, but it allows signers to ignore the fact checkers if they disagree with them and explain why. So in this case, if you signed the Fake News Pledge, I told Chaps, you would not have to take down your Scalia post, even though it’s been disproven by Snopes. Instead, I told him he could post an explanation on his Facebook page of why he disagree Snopes—like the one provided me. “I try to avoid pledges, but I also try to avoid fake news, so we’re on the same page, but I can’t sign sorry,” he wrote. So, my investigation identified eight fake-news items, posted on Facebook by five Colorado state legislators, Rep. Polly Lawrence (R-Roxborough Park) and Rep. Tim Neville (R-Littleton), as well as then Representatives Klingenschmitt and Kit Roupe (R-Colorado Springs) and then Sen. Laura Woods (R-Arvada). Only Rep. Roupe has deleted the fake news from her Facebook page. This entry was posted on Friday, January 13th, 2017 at 11:25 am	and is filed under Colorado State Legislature, fake news. You can follow any responses to this entry through the RSS 2.0 feed. You can skip to the end and leave a response. Pinging is currently not allowed.